For this week’s review, we’re going to have a look at the La Flor Dominicana Air Bender. 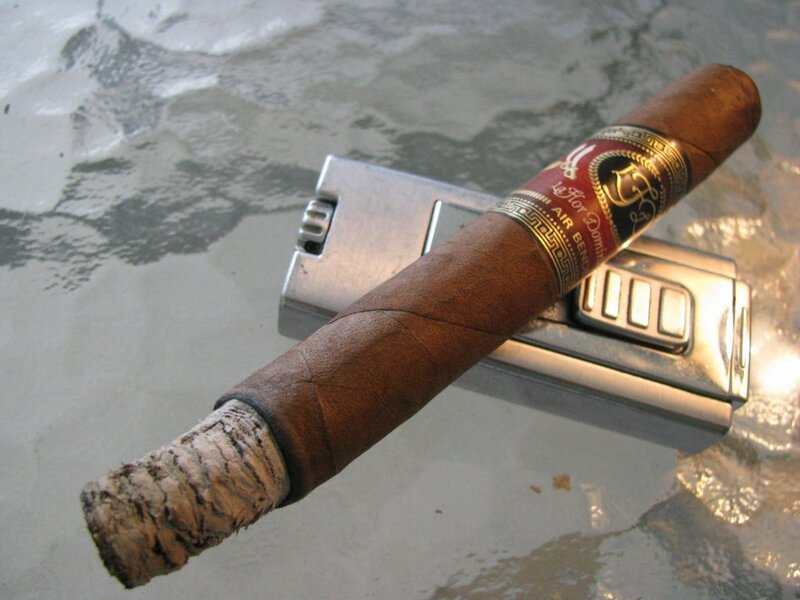 The selected vitola for the review is the Poderoso, roughly a corona at 5-1/2″ and a 42 ring. The Air Bender is produced in the Dominican Republic in seven different sizes, with an Ecuadorian Habano wrapper and Dominican Filler/Binder. In the Tampa area, it retails for about $6 per single, and about $5.50 per stick by the box. I have previously enjoyed this blend in LFD’s Chisel vitola, and thought I would give the Poderoso a try since I believe the corona to be one of the very best sizes to judge a blend. The first thing I notice when removing this cigar from its cellophane is its outstanding construction. It is tightly wrapped, with a beautifully applied cap that displays no visible wrinkles, tears, or defects of any kind. In fact, it is incredibly smooth. The pack feels uniform throughout the cigar, with no noticeably dense areas nor voids of any kind. Before lighting, the scent of the wrapper and foot are similar, and remind me of what I call “dark” flavors of figs or even oatmeal. The unlit draw delivers very traditional tobacco or hay flavors, and is comfortable and open. 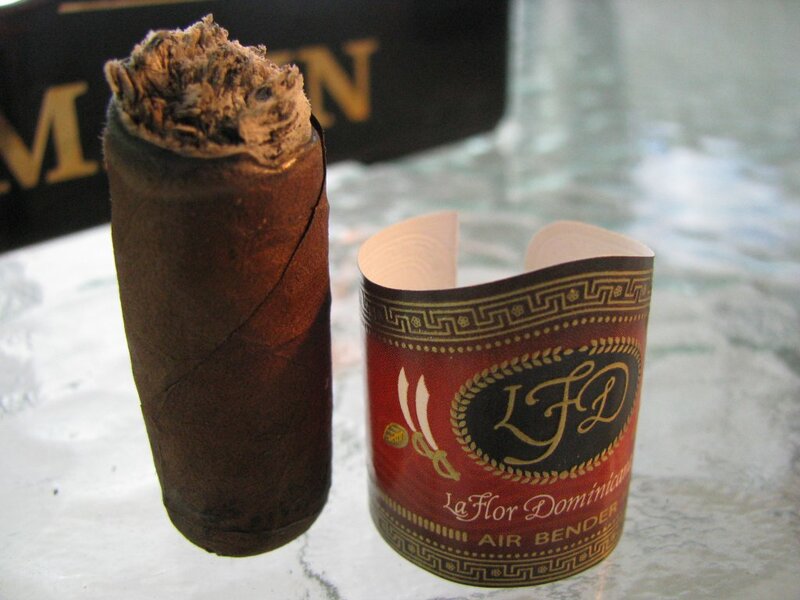 The cigar toasts easily and takes to fire readily and evenly. During the first inch of this stick, I took the time to examine the wrapper more closely. There were a number of moderately sized veins, and some tooth to the leaf. The “teeth,” or nodules, were very lowlying, however; almost seen as much as felt. This early, I found the smoke to be somewhat drying, causing me to reach for a drink frequently. I initially opted to enjoy the Air Bender with coffee, but quickly abandoned that idea and switched to a simple glass of ice water. The coffee was not interfering with the cigar – quite the opposite. The cigar overpowered the coffee. Rather than deal with wishy-washy coffee, and to escape the alkalinity of the smoke, I just went ahead and made the switch to water. The prominent flavors at this point remained similar to the prelight perceptions, especially with the oats. There is also a pleasant but noticeable nutty aftertaste, akin to almonds. From the one- to two-inch mark, the cigar seemed to produce considerably more smoke than earlier. The drying effect of the smoke on the palate persisted, but was not problematic. The ice water kept that in check. A bit of peppery flavor crept in at this point. I would more quickly associate this flavor with white rather than black pepper – similar taste without the bite. It was very pleasant to me, one who appreciates a bit of it but will often shy away from reputed “spice bombs,” because I do retrohale a fair amount and don’t enjoy too much burn in the nose. The pepper here is entirely enjoyable, however. I have to note the burn at this point. It has been absolutely impeccable. I did have to perform one minor touchup, but overall it shows the quality of the bunch and roll to be top notch. What impressed me most was the level field of ash when I did dunk the end. No penciling or tunneling at all. The ember was laser-level. I did detect some spice through the nose to accompany the pepper noted earlier. Still, the burn was moderate and definitely worthwhile when the pleasant, warming flavors and near perfect construction are taken into consideration. By this point, I began to notice a couple of new flavors presenting front and center. Pure, basic tobacco taste, which I find quite agreeable and satisfying came through boldly but certainly not in a harsh way. There was also a welcome return from the notes of leather I noticed earlier before and at first light. In the final stretch, the burn on retrohale disappeared entirely, although the flavor of pepper remained. 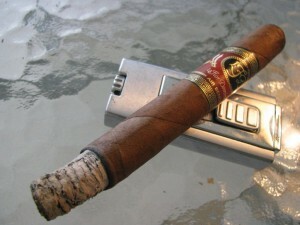 In the last few puffs from the cigar, the taste remained basically unchanged, although a bit of cedar was noticeable. I did have to perform one more slight touchup to the wrapper, but I am still overwhelmingly impressed with the burn on this stick. Overall, I greatly enjoyed this cigar. The flavors are bold and pleasing, yet never brash. The construction, at least on this one, was absolutely faultless. This flawless build is very attractive to me. It affords the smoker the opportunity to simply enjoy the cigar without having to worry or fret about it. One can focus on the more important aspects of relaxing and taking pleasure in the smoke. 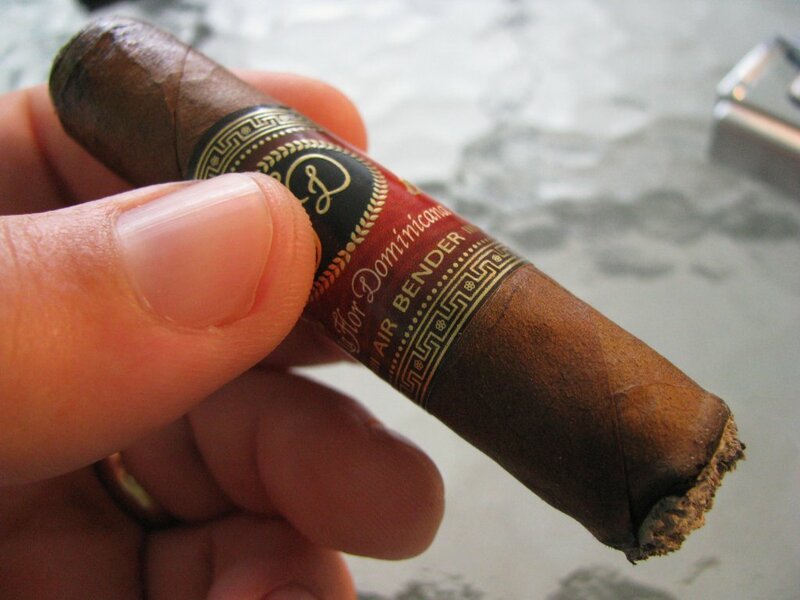 The Air Bender holds a special niche in that it has enough body and flavor to appeal to those wizened old denizens of dark, smoky cigar shops without being too imposing to the neophyte just breaking into the pastime. If you haven’t already, I would definitely recommend you give it a try. At the per stick box price of $5.50, I also think it is a great value.